Samsara Communications client, The Retreat Kitchen, is a vegan cafe in the heart of Richmond. 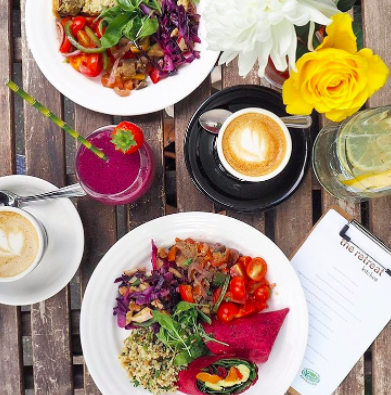 Launched earlier this year, the home of vibrant vegan food was set up by Maggie Nuttall, Claire Langdon and TV’s Nick Knowles following their life changing appearance on the BBC / Netflix programme, ‘The Retreat’. After experiencing a life changing month together in Thailand, they returned to the UK on a mission to spread their love of vegan, earth-friendly food far and wide. Join them for their Fermented Foods & Sprouting Workshop on 13th November. Sharing your love of vegan cooking with The Retreat Kitchen was a dream for you during your time in Thailand, how did you bring it to life? It was challenging, especially upon returning to the UK in the cold weather of February! It took a huge amount of self motivation and determination to continue with the vegan diet we had become used to at the retreat in Thailand. We had to make some huge changes and gain the support of our friends and families with our new way of eating and to build our food repertoire from scratch. We both had a keen interest in cooking and were always asking the cooks how our food was made when we were in Thailand. We were lucky enough to have a few cooking lessons and got some recommendations for cookbooks and websites to kick things off. It was very much trial and error and sharing tips and recipes with each other along the way - we both cooked solidly for the 12 months between returning home and opening the cafe! When we came back from Thailand we made it our mission to bring The Retreat Kitchen to life. The timing was perfect - we were both looking for a change in direction and had already spoken about wanting to share the positive impact the vegan diet had had on our own health and wellbeing. What are the challenges of setting up a vegan café? There have been many! It’s been a wild ride. It was tricky to find a location where we felt that we would fit in and be successful was the key part. We love being in Richmond and part of the community there. We have a unique selling point in that all the food we sell we make ourselves and is vegan but this can also be tough when we are so busy trying to keep up with demand! It has been a conscious decision to do it this way - we hope that our love and passion comes across in our dishes when people eat them. We wanted everyone to enjoy our food and not just a place that is exclusively for vegans. You (very bravely!) set up the cafe having had no professional training in this area - how has the learning curve been? The learning curve has been very steep - we threw ourselves in at the deep end and started swimming very fast! This may sound like a cliche but we have been totally blown away by the positive responses we have had on our dishes, we just work very hard at making food that we think people will enjoy. We had a soft launch as we were nervous about coping with food orders and even using the coffee machine to make our speciality coffee. But we were very lucky - everyone has been very supportive and patient and our friends and family have helped out with a few shifts along the way! Maggie and I love interacting with people and enjoy being customer facing especially when we get to talk about our food and our Thailand retreat experience. We have certainly learnt on the job and as our confidence has grown, so has our menu! You're the first café to get the Vegetarian Society's new Vegan Approved accreditation: what does it involve? We were very excited to be approached about this. We had our menu and ingredients inspected and we have shown that our products are free from animal flesh and that we don't use any ingredients resulting from slaughter, we are GMO free, cruelty free and that there is no cross contamination with non vegan ingredients during the production of our food. Because we are totally vegan this was quite a straightforward process for us and we now get to use The Vegetarian Society’s new vegan trademark on our menu which is an honour. What have been The Retreat Kitchen’s bestsellers so far? Our oat milk flat white is the best seller! We use Oatly barista edition which is creamy and sits so well on our coffee bean which is sourced from Old Spike Roastery in Peckham, a social enterprise that supports the homeless. They hand roast their coffee once a week and delivery is made via bicycle! Sadly we are just slightly too far away for that mode of delivery but we love that they keep their carbon emissions to a minimum where possible. It is very important to both of us to work with suppliers who share a similar outlook to us. In terms of food, Maggie’s cashew cheesy leek and broccoli quiche is always a winner and our English breakfast muffin topped with spinach, portobello mushroom, sliced avocado and homemade vegan hollandaise sauce goes down a storm for breakfast. What’s your big vision for The Retreat Kitchen? Once we have got Richmond in the bag we would love to open more kitchens, but one step at a time! What advice would you give to any would be entrepreneur who wants to set up in the same space? Know your figures and do your research! Be realistic with what you can achieve. Plan for the worst case scenario and ask yourself the difficult questions before starting out. Talk to as many people as possible and find something that will make you stand out from your competition that means something to you.